What are daily pay benefits, and why are they beneficial to your organization. Like all benefits, there are multiple ways companies can offer this benefit. Here are the three main types that have been identified thus far. Walmart is the best example of this approach. When a Walmart associate requests her pay before payday, Walmart simply runs its payroll system for that single employee. Walmart remits the payment to the employee, funds the payment itself, and files taxes with the IRS for the appropriate withholding. While there are some vendors involved in ancillary functions (e.g. the employee requests funds through a self-service user interface provided by Even Financial; and Walmart remits funds on a next business day basis through its ACH sub-vendor PayActiv), this alternative is primarily a DIY approach. Walmart is likely unique in its ability to run payroll daily, but this is certainly an option that exists to provide this benefit to your employees. The best analogy here is if a company decides to insure its own workers with healthcare insurance, and uses (i) a claims vendor to record the reimbursements and (ii) a payments vendor to remit the reimbursements via ACH. While the vendors have some involvement in aspects of the benefit administration, the bulk of the program is the company’s responsibility. Paycheck advances have existed since as long as anyone can remember. Historically, an employee would request an advance and the employer would grant the advance up to a pre-set limit, typically 50% of the employee’s pay. Today, technology vendors have operationalized this process so that employers can offer a paycheck advance without some of the administrative burden. Through this type of program, employees can receive a paycheck advance on a portion of their earned wages - typically, also 50%. In the same way that an employer says “I will give you a portion of your wages before payday in a paycheck advance,” a technology provider can provide limited access to an employee’s paycheck in advance of payday. Like a paycheck advance, these programs are typically company-funded, which requires employers to set aside payroll funds prior to payday. In addition, if you (the company) are funding the advance, you are required to file tax withholdings with the IRS on the day of the advance. The nice thing about these programs is that they create distance between you and the employee as it relates to the actual granting of the paycheck advance. Typically, paycheck advance programs are hard to implement at a company due to the fact that each employee has a different set of circumstances. In addition, the approval process becomes challenging and cumbersome, especially at a large organization. Technology providers such as PayActiv, Even Financial, and Instant Financial remove you from that equation and deal directly with the employee. These vendors offer “on-demand paycheck advances” and pull funds from your payroll account, or in some cases, may fund the payments themselves. Funds are typically issued via next business day ACH, or to a paycard. Note—if being issued to a paycard, the paycard vendor typically charges fees to the employee to withdraw funds at an ATM machine. 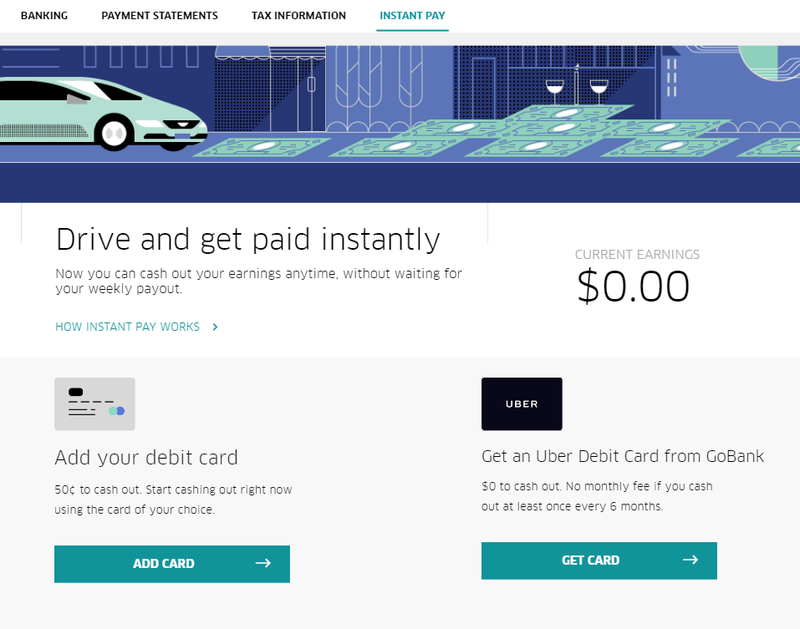 The other main type of daily pay benefit is called “instant pay”, and was first introduced to employees by technology companies such as Uber, Lyft, and Doordash. Instant Pay refers to a program where the employee can receive funds equal to any portion of their earned wages. The employee receives those funds instantly into any bank account or payroll card 24/7/365. The employee sees their funds accumulating in the vendor’s interface and knows that at any time, those funds are instantly usable, in the same way that they would be if they were in her bank account. The funding is typically done by the Instant Pay vendor, not the company itself. This dramatically reduces the burden on the company, while also avoiding the need to change a company’s tax withholding filings. The employee can receive up to 100% of her accrued wages. Those funds can be received by the employees in any bank account or paycard. When choosing a daily pay benefit, be sure to take notice of vendor’s definition of “instant.” It will be important to align on expectations when introducing a program like this to your employees. You can find a brief comparison in this chart. In 2010, Blockbuster failed to respond to market trends being driven by Netflix.In the early 2000s, Blockbuster had several opportunities to acquire a small upstart called Netflix. Secure in its belief that the home movie business would never change, Blockbuster declined every time. In 2011, Blockbuster went bankrupt, and today we can now watch a movie on our phone while waiting in line, thanks to Netflix. To be fair, Netflix didn’t come up with the concept of e-commerce or streaming or smartphones. Those things just happened. The genius of Netflix is that it identified a once-in-a-generation perfect storm of market forces that, on the surface, appeared unrelated to the industry, and they anticipated (correctly) the effect this perfect storm would have on the way we watch movies. Unrelenting market forces—unrelated to payroll—are conspiring to create major change in our industry. The result of this perfect storm is that employees want to control the timing of their pay. And employers will have to meet this demand. The first of these market forces has nothing to do with payroll per se, but rather how we consume goods and services. Everything from ordering an Uber to tonight’s dinner can be done from the palm of your hand. Millennials and the incoming Generation Z use payment apps like Venmo to instantly zap their friends money for pizza. “Instant” is not novel anymore. It’s the expectation. The second of these market forces is the tightness of the current labor market. 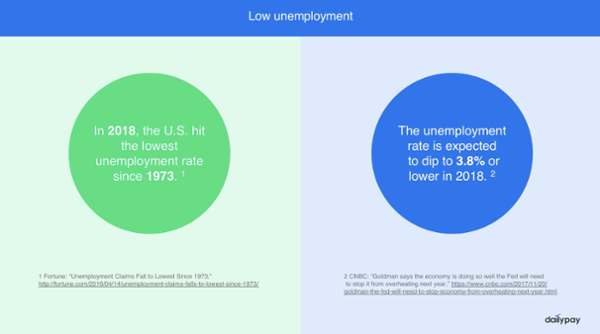 The unemployment rate is at its lowest since 2000, and it continues to decline. Companies simply cannot find and hire workers today. Even worse, once someone is hired, that person will leave for modest increases in wages, causing turnover expense for companies. According to the Center for American Progress, the average cost of employee replacement ranges from 16% to 216% of the departing employee’s annual salary. The third market force is that, according to a CareerBuilder survey, 78% of full-time workers live paycheck to paycheck. These workers incur, on average, $1,000 per year in late and overdraft fees as they wait to get their next paycheck before paying bills. The net result of these three seemingly unrelated forces is that companies must offer their employees an ability to meet financial obligations on time, or else face losing them in a difficult labor market. We are witnessing first hand a movement by companies to address these challenges by offering their employees control over the timing of their pay. Leading companies have already started offering their employees an instant pay option, enabling them to access earned wages on their own timing. Importantly (and great for the payroll industry), technology now exists so employees can receive this benefit without the employer changing anything about its payroll process, including the timing of payroll funds. Ask anyone under 35 about the last time they drove somewhere to rent a movie. At best, you’ll get childhood memories. In a few years you’ll get the same reaction if you ask when payday is. Which vendors produce a daily pay platform? And how do they differ? When it comes to picking a vendor, there are certain criteria to consider. 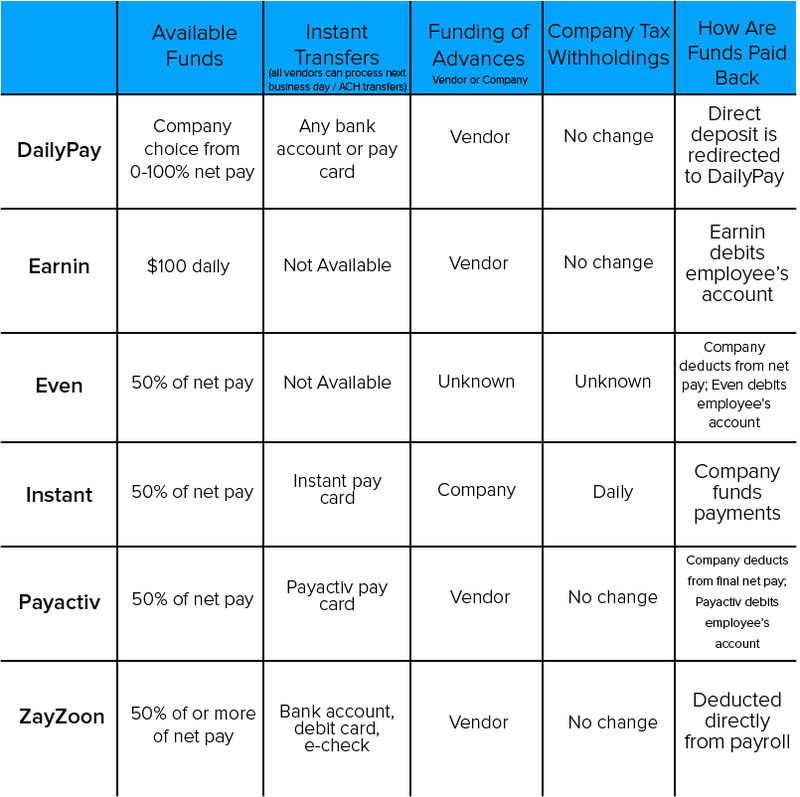 This chart provides an at a glance view of the features provided by each daily pay benefit provider. Models that require a deduction from the employee’s final paycheck are not compliant with wage deductions laws. All payroll professionals are encouraged to check state by state wage deduction and assignment regulation. In addition, models that result in the vendor debiting the employee’s account may cause consumer finance and/or reputational harm to the employer. NOTE: All of the information in this chart is gathered from sources that are publicly available. Daily-Pay-Benefits.org is not responsible for the accuracy of the information here. There are a few different ways daily payment programs can be priced. The three most popular are the transactional model, the subscription model, and the paycard model. In the transactional pricing model, an employer or an employee pays per use of the daily payment benefit. For example, if an employee wants to access her earned-but-unpaid wages using a service that utilizes the transaction model, that employee will have to pay a small fee each time she does so. The transaction model enables employees to exercise a greater degree of freedom in accessing their pay, as it does not require a timed, routine fee. That is, a transactional approach enables an employee to only withdraw whenever they require it. Some see the detriment of the transactional model as follows: employees will have to pay a fee each time they transact, so if an employee is making several transactions a month, their fees may be quite high. However, a daily payment benefit typically enables employees to exercise financial freedom and comfort in a way that does not require many transactions a month. Employees are typically using this benefit to make ends meet, not to make several transactions a month for weekly non-essential spending. As such, a transactional model allows employees the fiscal freedom to pay a very small fee only when they need to access their earned but unpaid wages, similar to how one uses an ATM machine. This model makes the most sense for employees who don’t require several withdrawals, and allows the employer the most comfort in knowing that they are contributing to their employees’ financial wellness. The Consumer Financial Protection Bureau (CFPB) outlines basic financial needs that everyone needs to take care of. Learn what those needs are, and why daily pay benefits contribute to financial wellness. 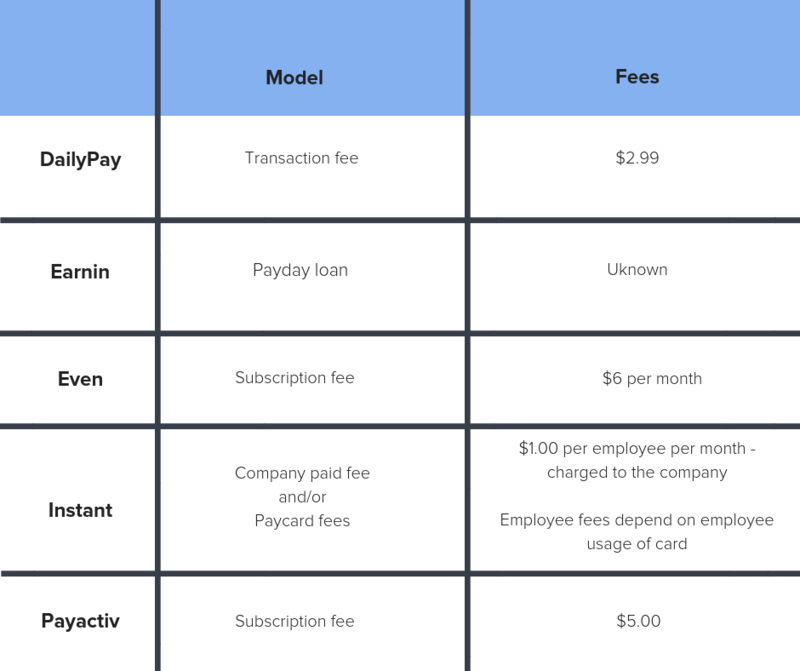 A subscription based model allows employees to pay a one-time, routine (usually monthly) fee to use the daily payment benefit over a period of time. For example, if an employee wants to access her earned but unpaid wages via a subscription model service, she would pay a lump sum fee for a month to use the service an unlimited number of times. Typically, subscription models also utilize caps on the amount of money an employee is able to take out per month. The subscription model enables employees to attain more flexibility in the amount of times they access their pay. Ideally, the subscription model works in such a way that employees can make a handful of withdrawals over the course of the month, with the fee payment made at the beginning of the month. One thing to consider is that employees have a hard time cancelling a subscription. This hurts the employee beyond their initial paycheck, and can further erode the relationship between the employer and the employee. Further, employees often don’t need access to their paycheck early every month or even every week. 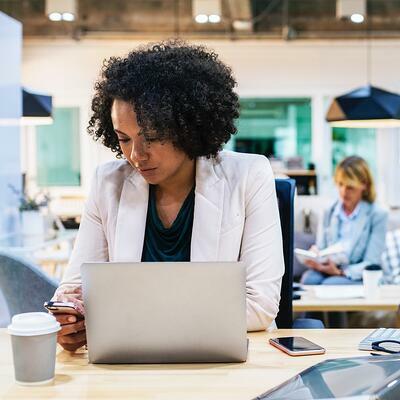 Using a subscription model may encourage employees to access their earned income more frequently than they need to, straying from the goal of enabling financial wellness. Overall, a subscription based model must be structured meticulously and very clearly to be effective and helpful to both employers and employees. A third model is the pay card model. Vendors who utilize this model incorporate a prepaid card in enabling employers to pay their employees. Every payday, vendors who use this model will load the pay card with the employee's earned wages for that pay period. Employees can use the card like a debit card to make in-store purchases, or they can use the paycard to withdraw wages through an ATM, bank cashier, or purchase where they receive cash back. The detriment of this model is that pay card companies often directly charge the employer a fee to use the card. This takes away from the employer’s direct benefit and ties the employer only to use of the pay card (taking away some flexibility with respect to implementation). The other important consideration regarding usage of a pay card program is when a company already has a pay card program in place. It is important to evaluate the cost of removing that existing paycard program and replacing it with a new one if necessary down the line, or simply deploying a more universal instant payment solution that reaches all bank accounts, all paycards, and all cash cards. It is essential to consider the upsides and downsides of all three types of pricing models when onboarding a daily payment benefit. Employers considering onboarding this benefit should discuss this very clearly with providers they seek to use. This chart is based on publicly available information via media, company websites, and third party testimonials. Therefore, Daily Pay Benefits is not responsible for the accuracy of this information. In today’s digitally connected world, people expect to be paid quickly. According to research from industry analyst firm Aite Group, companies make more than 1.9 billion payments to consumers annually. These payments – known as disbursements - include insurance claims, rewards, and rebates. They also include payments from businesses to workers. For gig economy workers, freelancers and even employees receiving regular paychecks, digital payment options enable them to get paid faster and, in some cases, as quickly as a wage is earned. Despite the emergence of innovative payment platforms and technology providers, almost half of disbursement payments are made by checks today, which can be an expensive and slow process. Digital disbursement solutions solve these pain points, providing multiple fast and secure payment delivery options and simplifying the time-consuming task of paying large numbers of consumers or employees. A digital approach complete with real-time reconciliation and tracking also lets all parties monitor payment status during each step of the process, which can reduce operational overhead and improve satisfaction. Digital disbursements are designed to help businesses reduce costs and reduce the time required to get funds to the consumer. Money can be deposited directly into the recipient’s own bank account the same day. When consumer financial account information is not accessible, these solutions offer secure tools to gather that information or support payments using social tokens such as emails or mobile phone numbers. 1. Your competitors are doing digital disbursements. The digital landscape is fast paced and requires businesses to continuously adapt to remain competitive. There’s a high consumer demand for digital disbursements to replace checks and speed up payments. Both emerging and traditional businesses are finding that offering faster ways to pay their workers helps them align to the way people live and work today, enabling them to boost employee satisfaction and retention. 2. Your customers and employees are asking for digital disbursements. Change is driven by consumers– in fact, according to a survey by PYMNTS.com, 62 percent of millennials already use digital payments to send and receive money. What’s more, over half of consumers prefer to get paid via a direct deposit in place of a paper check. 3. Speed of payments matters. One of the key features that attracts consumers and employees to digital disbursements is the speed in which they receive funds. Digital disbursements eliminate the wait time of receiving a paper check in the mail or waiting for the next payroll cycle to receive a direct deposit. Tellingly, 84 percent of gig workers saying they would work more if they were going to get paid faster, according to the PYMNTS.com survey. 4. Digital disbursements can be easy. What’s involved in the initial setup? How easy is it to add enhancements down the road? What support tools and resources are available? Is the solution secure and reliable? How are regulatory considerations handled? It’s important to look for an “all-in” solution. 5. Are digital disbursements cost-effective? Yes. On average, according to Aite Group, it costs a business $5.91 to issue a check, which includes the process of supporting checks from an operational perspective as well as the higher fraud losses associated with checks. If half of the 1.9 billion digital disbursements made annually were converted to digital transactions, that could translate into a $3.3 billion savings for businesses. Beyond reducing a reliance on checks, a flexible solution that allows businesses to “mix and match” payout options can help strike a balance between managing costs and optimizing customer and employee satisfaction. With the right payments partner, businesses can outsource the bulk of their payment technology needs, along with operational, risk and compliance support, allowing them to focus on their core business. Digital disbursement solutions allow businesses to meet expectations for how and when people want and need to be paid. Businesses that employ these solutions can foster satisfaction, reduce turnover and stand out from competitors with payment capabilities that align to today’s fast-paced digital lifestyles. Tammi Shapiro is Vice President of Product Management and Strategy for the Electronic Payments division at Fiserv where she is responsible for new and emerging digital payments products. Tammi has nearly 15 years of experience in the fintech space. Prior to Fiserv, she was Director of Product Strategy at CashEdge and also held management roles in product management and marketing at American Express. Tammi received her BA from Northwestern University and an MBA from The Wharton School at the University of Pennsylvania. She resides in New York, NY.